Easter is a time we celebrate our risen Lord, Jesus Christ. He proved that He is the Son of God, and that there is life after death. Jesus predicted his death and resurrection 3 times in Mark (8:31, 9:30-31, 10:33-34). We don’t worship a man who was a martyr, or a dead god. We worship the living, one true God. 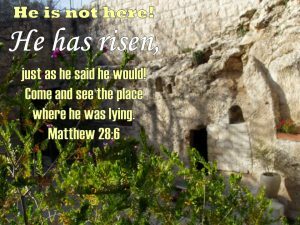 He has Risen, He has Risen indeed!